Ward 3 in Malden has 4,353 registered voters. In the 2015 municipal election, 1,282 folks in Ward 3 came to the polls to vote for mayor, city council, and school committee. In the 2017 preliminary election, 737 folks in Ward 3 came to the polls to narrow the councillor and school committee field to two candidates. In the 2016 presidential election, 3,548 folks in Ward 3 came to the polls to vote for president. 2,451 people voted for Hillary Clinton. 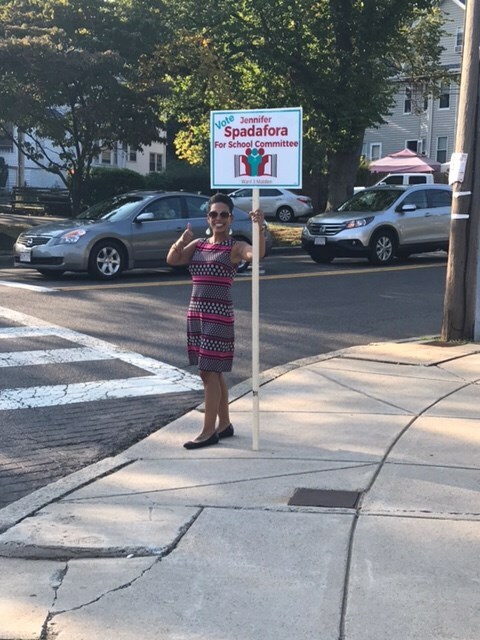 So, you’re running for school committee in Ward 3 in Malden. How much money do you think you would need to win this seat? Would you believe $11,490.85? That’s the amount Mekka Smith reported as her ending balance on her October 20 Campaign Finance Report. That’s a little more than $10 for each and every person who came out to vote in the last municipal election in Ward 3. Mekka Smith joined KIPP Massachusetts in 2016. She is originally from Atlanta, GA, and started teaching in 2007 through Teach For America, where she worked with brilliant first and second grade students in Miami, Florida for five years. Mekka has been actively involved in new teacher development through working at TFA summer institutes in Atlanta, Houston, Philadelphia, Tulsa, and Boston. In 2012 she joined the Teach For America-Massachusetts regional team and spent the next few years coaching teachers in elementary, middle, and high schools as well as supporting alumni to find high impact, school-based roles in local district and charter schools. The contributors include Andrew Balson ($1000) of West Newton, who was also active in the Yes on 2 campaign to remove the cap on charter schools, and Chuck Longfield ($250) of Cambridge who gave $100,000 to the Yes on 2 campaign. Several other contributors are also high profile charter school backers. Our oldest child, Rene, is a recent graduate of Malden High School, class of 2017. She has chosen to serve her country and has enlisted in the United States Coast Guard. We are also the proud parents of two younger boys, Gino and Angelo, who are both students at the Beebe K-8 School. Having watched all three of my children advance through the Malden Public School system, I have learned that while budget cuts may at times be inevitable, my focus if elected would be to fight for funding and a financially sound, responsible school budget. Spadafora was also active with the NO on 2 campaign. Campaigns aren’t easy, and it’s easy to feel alone when you are being swamped by thousands of dollars in out-of-state contributions from the charter school industry. Post-script. It gets worse. On November 3, the Mekka Smith finance reports were amended to add another $3,000 of dark money. Being that closely connected to charters ought to be disqualifying in a school committee race. That would be a conflict of interest. I’m pretty sure one is not allowed to be simultaneously on a school committee and public school staff within the same district. It’s legal. The only restriction is for people who are employed by the school department. It’s up to the voters to decide if this candidate conflicts with their interests. Charter schools are “public,” remember? These people are the bottom-feeders of corporate America. They are actively selling our public schools so they can be part of the managerial class. It’s all about rents. When the wealthy class owns all the schools, we’ll rent education from them and the working class will continue to get hammered by an economic system that has them in the cross hairs. Then we could argue they are employed by the school department – right? Weren’t charters supposed to operate with at least some oversight by the local district, even while being allowed more flexibility in experimenting with various methods? They are totally independent. The only thing the city or town gets from a charter school is the garnishment from its Chapter 70 funds to pay the charter school tuition. Pablo is right. While people may sometimes talk things over on an informal basis, there is no direct oversight of, for example, Mystic Valley Charter School, which happens to be located in Malden, by the Malden Public Schools district or the Malden School Committee. there is no direct oversight of, for example, Mystic Valley Charter School, which happens to be located in Malden, by the Malden Public Schools district or the Malden School Committee. “No direct oversight” is the point of charter schools. The charter — the legal document that outlines expectations, boundaries and guidelines — is the oversight and if they hew to it, they get the charter renewed. If they don’t, it is revoked or expired. If it helps to think about it as though it were a contract, you may do so… A teacher or administrator says “I can do better if the board gets of my back.” to which the board replies “we’ll get off your back if you agree, ahead of time, to the metrics and the rules. We’ll get off your back but we’ll check back with you periodically to see if it’s working according to the prior agreement..” That’s the theory anyways… and dozens upon dozens of people — even some here — have alternate theories of whether or no this works or is workable. At present the charter approval process is run at the state level with the board of elementary and secondary education (which, perhaps only coincidentally, operates in Malden) but each application for a charter is subject to review and input by the local school committee (but they don’t, as far as I know, have an absolute veto) If it were up to me the local school committee would have the final say on all public schools, traditional or charter, contained within their actual domain with the state board in an advisory position… but I recognize the present setup is supposed to be a bulwark against discrimination by NIMBY… so there’s that. “Demonizing teachers’ unions” seems to be another “point” of charter schools. Thanks for the detail. As someone who lives in the ward and worked for a third candidate who was eliminated in September’s preliminary election, I have followed this race extremely closely. While, this data confirms our first impressions, the money is only one piece of this picture. Ms. Smith seems nice enough, but she has been unable to convince voters that she is about more than charter schools and TFA–or to really clarify her position on the role of charters. Before she filed papers in late July, she was virtually unknown in the community. But she’s been running a strong ground game and may win–if people don’t look beyond the fact that she has a lot of education experience. Pablo, this is great research, and I love that it’s a local item, but I’m not that wowed by $11,490.85. How much direct mail does that cover? Cambridge School Committee races are far more expensive. That’s a modest amount of money by comparison.I think I the candidate should be judged on her own vision and experiis nice rather than be branded with guilt by association for working with TFA and a charter. I’m working in a charter now, despite being a critic of their funding stream and a No on 2. It’s because I like my schools mission and it was a good fit for where I am in my teaching career. Every TFA teacher I know is a dedicated teacher and one of their Executive Director’s was someone I worked with closely when we were Mayoral Fellows. I know him to be a proud progressive along with my friends in TFA. TFA and charters have flaws, and they have flaws that should be reformed and addressed. Yet I wouldn’t ban people who’ve taught in them from public service, and frankly, most people who choose to work in either organization are professionals committed to public service. I respect the MTA, all its members here, and look forward to punching my card someday. But the attacks are becoming awfully personal, especially since it already won the battle when it comes to charters. She can’t build more as a school committee member since the cap is in place, and she can’t deunionize the MPSD. So judge her on her ideas and experience-and she may or may not be the best fit. I’ll leave that up to the Malden Ward 3 voters. Cambridge runs city-wide. I have run and won in Arlington in five town-wide elections, 29,000, for less than half of what Ms. Smith has to spend on one little ward election. Malden is a city that’s twice the size of Arlington. It’s also more diverse demographically and politically, and outreach costs could very well be more expensive in that community as well. You’re making her out to be the next Leland Cheung when her total warchest is nearly a tenth of his and her contribution percentage from charter advocates is even smaller. I have no horse in this race and trust ltjmalden’s judgment on her community over yours or mine. I am just saying this isn’t nearly the same thing as DFER trying to buy a State Senate race. A plan that backfired badly for them along with Question 2. The idea that anyone who ever taught for TFA or a charter is disqualified from serving on a school committee is similarly absurd. If she is presenting these facts dishonestly or hiding her record in any way that’s one thing, but just as you can support the troops and oppose the war, you can teach for TFA or a charter without endorsing all their problematic attributes. Just as I wouldn’t judge the BTU or MTA membership by its worst members, something the DFER folks have been guilty of in the past. Progressive educators should aspire to stronger arguments than guilt by association. The bigger issue, where I think we do agree, is how little say school committees have over charters in their districts. Next to no permission or oversight, and that’s definitely germane to a candidates view on the issues. So let her positions speak for that-not her resume or small contributors. I agree on the charter school teachers. They are, after all, just workers, The people I object to are the people who jump from the classroom to management and charter school founding by virtue of their connection to the very rich. Sorry jconway but Malden is not “twice the size of Arlington.” The population of Malden is 60,840; the population of Arlington is 42,844. But the relevant number is not the sizes of both communities, nor how much more expensive campaigns in Cambridge elections are. This is a ward race and Pablo pegged the ward registration at 4353 voters. No community should have its politics compared to Cambridge, where Councilors have minimal responsibilities and are paid more than state legislators, and the city manager’s salary is $360,922, double that of the governor. God save the taxpayers if the rest of the state followed the salaries and campaign practices of Cambridge. That’s a very fair and good point indeed-this former Cambridge taxpayer agrees! I don’t want to ban charter employees from all public service – just school committees in towns the charter serves as that strikes me as a conflict of interest. That’s fair. Same as the school department employee ban-but it’s not clear from the OP which charter she worked at. I think skepticism is warranted-but let the candidate answer to the charges. Smith works as chief of staff for KIPP, a multi-state charter organization. She has no affiliation with the local charter school in Malden (MVRCS), though KIPP operates a school in neighboring Lynn. I’ve found her hard to pin down on where she stands on charter policy, or her position on Q2. That’s one of my biggest objections, really. As for the money, it’s not small. I told my candidate she’d want $5-8K for this race, and thought I was aiming high for an open seat. (BTW, thanks for the vote of confidence.) The dominant narrative re: pro-charter forces organizing to elect people in local races may or may not be operating in this case, but I’ve decided I don’t want to take the chance. Ah now there’s some clarifying info-chief of staff is an administrative role and a fair place to evaluate what she brought to the table in that capacity and whether it’s the best fit for leading Malden schools. Presumably she would (have to?) step down from that position? That’s a fair place to pin her down on some specifics. And she absolutely can be judged by her record at that school and that schools overall record in its community. It’s unfortunate more broadly that reform isn’t going in the direction it ought to be. We need to invest far more in our teachers, hire more of them, reduce class sizes and find a more equitable way to raise revenue than relying so heavily on property taxes. I feel like most educators in any capacity understand this-but policymakers never seem to focus on them. I think some policymakers do understand the issue, which is why the Fair Share Amendment will be a big plus. Innovation and real improvement can take place within our public school system, and the steps you list are a start. It just takes leadership, money, and political will. I don’t believe School Committee is a paid position, so I would not expect her to step down from her day job and I don’t believe she would be required to. Some towns do offer stipends to SC members, but that’s not the point. I am just very skeptical that someone could look out for the best interests of a public school system, it’s faculty, and students, if she is on a charter payroll. Since this is a ward election, concerning 4,353 people in what (I’m guessing) is a fairly tight geography, I’m not clear the point of asking “how much” direct mail that 11.5K could buy. It’s entirely possible, over the course of the few months, to meet and greet a predominant majority of the residents of the ward, face to face (if, in fact, you don’t already know a bunch of them…). One or two pieces, per, of direct mail might serve as a reminder but any more than that I think has rapidly diminishing returns. I would think that 11.5K in this kind of race means you can afford better production values on the direct mail but not larger amounts of it… I don’t know what the local (Malden) ordinances are, if any, on lawn signs and placards, but that’s probably the place where more is better. I think that kind of money also enhances some of the intangible but important things like nicer outfits and getting your hair cut, or even styled, more often in order to make a better face-to-face impression. In addition you can probably feed your volunteers better and maybe have your own, rudimentary, phone-bank.